Opening address to the Association of Palliative Care Social Workers Tackling Poverty in Palliative Care Conference York University 13th September 2018. One of our greatest achievements as a nation has been the creation of a free at the point of need health service: a system that is there for you – whether you be rich or poor: or perhaps I should say – it used to be. All too often when a person is entering the terminal phase of illness they and their families experience inexcusable uncertainties over how their care is to be funded. Not infrequently, they are confronted by a service where managerialism has triumphed: where the state of the Clinical Commissioning Group’s (CCG) budget dictates the outcome. All too often this means that there is no free at the point of need healthcare provided. To identify the reasons why this state of affairs exists, we must look back many decades – this is not a problem that can be blamed on the credit crunch or indeed Brexit. In 1948 it was inevitable that health and social care services should be separate: inevitable and sensible to means test social care. However, that reasoning stopped making sense 40 years ago – but by then Governments had ceased to be interested in the radical development of social welfare provision. The divide between means tested and free at the point of need services – produces two organisations each with separate budgets. ‘Budgets’ need managers just as bee-hives need wasps – and of course the last 40 years have been the golden period of managerialism. During this period we have developed increasingly long rulebooks, assessment tools and forms. We have recruited an army of form reviewers and just to keep everyone busy we have also created targets, statistical reports and a new anxiety syndrome ‘OBD’ – Obsessional Benchmarking Disorder. I wanted to start this talk by looking at the bigger picture – but I will now delve into the detail of the statistics, the rule books and the impenetrable tools. In so doing I run the risk of exacerbating many managers’ OBD, as I will use the statistics to illustrate the serious disparities that exist within the system. We are concerned that there is still considerable variation in the criteria for continuing healthcare … that people who meet the criteria in one [NHS area] … because of their palliative care needs, fail to satisfy the criteria in another …. This is unfair, and is incompatible with the principle of a national health service. … We recommend that the Department develop national criteria for continuing healthcare, including criteria for palliative care, to remove the inequitable anomalies that arise between criteria operated by different [NHS bodies]. there were only 23 fast tracks in Haringey but 271 in Hounslow and 11 in North Kirklees compared to the 550 in Wolverhampton. Statistically, therefore you are 12 times more likely to be fast-tracked in Hounslow than Haringey and 33 times more likely in Wolverhampton than North Kirklees. The NHS has core responsibilities for people who are (among other things) entering the terminal phase of illness. An ‘illness’ is widely defined: it includes ‘any disorder or disability of the mind and any injury or disability requiring medical or dental treatment or nursing’. ‘Nursing’ is not defined by the legislation but it is a verb. The Shorter Oxford English Dictionary (OED) gives nine principal meanings of the verb (and 21 variations) of which only two use the noun ‘nurse’ (a ‘wet-nurse’ and ‘to perform the duties of a sick nurse’). In the context of NHS CHC the OED’s most apt definition is ‘to wait upon, attend to (a person who is ill)’. The framework guidance in England and Wales makes clear that who does the ‘nursing’ is irrelevant – it could, for example, be a mother, a wife or a residential care worker. The main palliative care guidance is also health related – for example the 2010 GMC good practice guidance and the National Institute for Health and Care Excellence (NICE) guidance and Quality Standards. The distinction between the funding responsibilities of social services authorities and NHS bodies is a legal one. Social services departments and CCGs are creatures of statute and the obligations they owe to adults with health and social care needs are primarily set out (in England) by the Care Act 2014 and the NHS Act 2006. The 2014 Act, states that once a person’s nursing needs are above a certain level (identified by the Court of Appeal in its Coughlan judgment) then it is unlawful for social services to fund their care: all their health and social care needs have to be funded by the NHS. In Coughlan the Court of Appeal held that social services could only fund ‘nursing’ related activities if the nursing task was ‘merely incidental or ancillary’ to the provision of social care and of ‘a nature which it can be expected that an authority whose primary responsibility is to provide social services can be expected to provide’. In its view this was primarily as ‘quantity / quality’ test: only nursing care that was low level – both in terms of its quantity and quality – could be funded by social services. So, for example in the ombudsman’s Pointon report the care provided by a wife (who was a music teacher) for her husband with advanced dementia (primarily managing his challenging behaviour) was considered to be outside the quality / quantity limits of what social care could provide – and so all his health and social care needs fell to be funded by the NHS. In 2007, in England, framework guidance concerning NHS CHC responsibilities for adults was issued by the Department of Health. Accompanying this was a Checklist, a Decision Support Tool (DST) and a Fast Track Pathway Tool (FTPT). These documents have been updated (in 2009, 2012 and 2018) and have (with minor variations) been adopted in Wales (the most recent versions issued in 2014). The 2007 framework emerged as a result of a critical court judgment and a highly critical ombudsman report concerning the previous guidance. The Department of Health made it clear that, as a result of the 2007 reforms, it expected health and social services bodies to ‘think and act differently’, and that more people should become eligible for full NHS CHC funding. Although the numbers of people eligible for NHS CHC funding in England have risen by about 25,000 since 2007 (see diagram 1 below), during this period the number of overnight NHS funded beds in England have fallen by 39,000 – meaning that there are 14,000 fewer people being funded overnight by the NHS today than 10 years ago. What is also of interest is the proportion of NHS CHC funded people whose eligibility derives from the fast track process. Although disaggregated figures have only recently been publically available – it appears that fast tracking accounts for a third of all NHS CHC funded patients. any other input-related (rather than needs-related) rationale. Each one of these is important – but it is the final ‘input rationale’ point that is often overlooked. It means, among other things, that a person can be eligible for NHS CHC funding even though not receiving any NHS support. The ombudsman complaint concerning Mr Pointon, for example, found that he was eligible for NHS CHC support even though cared for by his wife without NHS input – since the nursing care she gave him was ‘equal if not superior to that that Mr Pointon would receive in a dementia ward’ (para 46). In similar terms, the Haringey proceedings concerned a child whose tracheostomy was manged by her mother (who had been trained to do this). It was this care that meant she was eligible for NHS CHC – even though it was not provided by the NHS or (like Mrs Pointon) by a nurse. The same, of course, holds true for individuals in need of palliative care. The emphasis, throughout the 2018 framework, that the ‘setting’ is not a relevant determinant for eligibility, appears to have been side-lined by the practice of some CCGs which have a fixed policy of not assessing for NHS CHC eligibility in a hospice setting. This is a clear misuse / misconstruing of the cautionary comments in the framework concerning the use of the checklist in an acute hospital setting – the need to assess when the individual’s ‘needs on discharge are clear’ (para PG.18.1). Such an approach (if used flexibly) can make sense in relation to patients who can be expected to make a significant recovery on discharge, but must generally be inappropriate for patients in a hospice. In any event, a fixed policy of this nature would be (a) contrary to the regulations (which require an assessment ‘where it appears that … there may be a need’ for NHS CHC); and (b) an unlawful fettering of the CCGs discretion in relation to its duty to assess. an individual may currently be demonstrating few symptoms yet the nature of the condition is such that it is clear that rapid deterioration is to be expected in the near future (para 229). It is the responsibility of the appropriate clinician to make a decision based on whether the individual’s needs meet the FTPT criteria. In such cases the FTPT replaces the need for a Checklist and DST (para 225) and CCGs should have processes in place to enable ‘care packages to be commissioned quickly. Given the nature of the needs, this time period should not usually exceed 48 hours from receipt of the completed FTPT’ (para 238). The care package provided will be one that ‘the CCG assesses is appropriate to meet all of the individual’s assessed health and associated care and support needs’. Although the CCG is not bound by the views of the local authority on what services the individual requires the local authority’s of what the person needs ‘will be important’ (para 172). In 2017 the Equality and Human Rights Commission (EHRC) wrote to 43 CCGs that had imposed ‘cost ceilings’ on the amount of support that they would provide to enable those eligible for NHS CHC to live in the community. The policies, in essence, stated that care costs would be capped by reference to the cost of a care home placement (plus a specified percentage uplift). The EHRC considered these policies conflicted with European Convention on Human Rights Article 8, the UN Convention on the Rights of Persons with Disabilities Article 19 and the Equality Act 2010 s149. In May 2018 the EHRC reported that the CCGs had ‘demonstrated that they are in the process of revising their policies, meaning further legal action is not necessary at this time’. The 2012 Regulations state that CCGs must decide that a person is eligible for NHS CHC upon receipt of a FTPT where a clinician has decided (and given reasons) that ‘(a) an individual has a primary health need arising from a rapidly deteriorating condition; and (b) the condition may be entering a terminal phase’. A properly completed FTPT is therefore binding on a CCG. However anecdotally social workers have indicated that some CCGs not infrequently reject or return properly completed FTPTs. 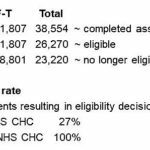 The statistics however paint a uniformly reassuring picture – ie that 100% of all FTPTs result in an award of NHS CHC eligibility (see Table 1 below). Once a person has become eligible for NHS CHC funding through the FTPT process, their funding cannot removed ‘without their eligibility being re-considered through the completion of a DST’ – ie the usual assessment process (para 244). Many people in need of palliative care will, of course, be eligible for standard NHS CHC. In most cases it must be probable that those who cease to eligible by reference to the fast track criteria would nevertheless continue to be eligible by virtue of their healthcare condition. Importantly, at para 190 the framework stresses that neither a CCG nor a LA ‘should unilaterally withdraw from an existing funding arrangement’ and that if agreement ‘cannot be reached on the proposed change, the local disputes procedure should be invoked, and current funding and care management responsibilities should remain in place until the dispute has been resolved’. The CCG may need to provide additional support to care for the individual whilst the carer(s) has a break from his or her caring responsibilities and will need to assure carers of the availability of this support when required. This could take the form of the CCG providing the cared-for person with additional services in their own home or providing the necessary support to enable them to spend a period of time away from home (e.g. a care home). It will come as no surprise to hear an academic concluding that there is a need for research. This however is an area where such a call has much validity – especially as, so far as I am aware, there have been very few if any independent studies concerning many of the issues I have outlined in this talk. We have no clear evidence, for example, of the reasons for the recent significant fall in NHS CHC numbers. We have no clear evidence as to whether the anecdotal evidence from social workers about the increased managerialism and local rules concerning the use of Checklists, Decision Support Tools and FTPTs is valid. We have no clear evidence as to why there is a mismatch between the experiences of practitioners and the statistical returns concerning the conversion rate of FTPTs. Cerebra Professor of Law & Social Justice, The School of Law, University of Leeds. House of Commons Health Committee 4th Report 2003–04 on Palliative Care, v1, HC 454-I (2004) para 47. NHS England NHS Continuing Healthcare Quarterly Figures CCG Q1 2018-19 (9 August 2018). NHS Act 2006 s275 and the NHS (Wales) Act 2006 s206. As it was (respectively) in R (T, D & B) v Haringey LBC  EWHC 2235 (Admin); the ‘Pointon Case’ Health Service Commissioner Report ‘Funding for Long Term Care’ case No E.22/02/02-03 (2003); and Secretary of State for Work and Pensions v. Slavin (2011)  EWCA Civ 1515. GMC Treatment and care towards the end of life: good practice in decision making (2010). NICE End of life care for adults Quality standard [QS13] (November 2011 updated March 2017) and see also NICE Care of dying adults in the last days of life NICE guideline [NG31] (December 2015) NICE Care of dying adults in the last days of life Quality standard [QS144] (March 2017). R v. North and East Devon health authority ex p Coughlan  2 WLR 622. The ‘Pointon Case’ Health Service Commissioner Report ‘Funding for Long Term Care’ case No E.22/02/02-03 (2003). R (Grogan) v. Bexley NHS Care Trust and others  EWHC 44 (Admin). Health Service Ombudsman’s Second Report for Session 2002–03 NHS funding for long term care, HC 399, 2003. Department of Health, Resource pack: PowerPoint Introduction Module 1: slide 7 (2007). NHS England Average Daily Available and Occupied Beds (KH03) Time series Aug 2018. R (T, D & B) v Haringey LBC  EWHC 2235 (Admin). The National Health Service Commissioning Board and Clinical Commissioning Groups (Responsibilities and Standing Rules) Regulations 2012 SI 2996 reg 21(2). Ibid reg 21(13) – which defines this as the clinician responsible for the diagnosis, treatment or care of the individual under the 2006 Act and a registered nurse or a registered medical practitioner (see also the framework para 220). Ibid reg 21(8) & (9). eg because they are no longer considered to be entering the ‘terminal phase’. The framework notes (para 265) that even if a person is not eligible for NHS CHC funding ‘the NHS is expected to arrange and fund’ (among other things) ‘palliative care and end of life healthcare’ (in addition to from NHS-funded Nursing Care).